As someone who’s been looking to expand his PS Vita collection for some time now, Psychedelica of the Ashen Hawk has been on my radar since it released this past June. The artwork really struck a chord with me and the initial impressions that I saw were very positive. 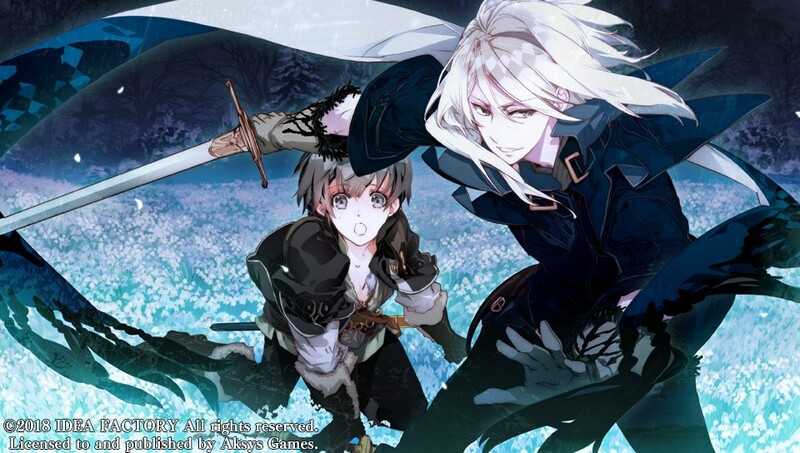 However, given that it’s an otome visual novel, I initially passed on picking it up and playing it. Having played it now though, I can honestly say that was a big mistake. Visual novels generally aren’t my cup-of-tea and otome most certainly aren’t aimed at someone of my demographic. My original assumptions were that this would end up being some sappy romance story with tons of fan service (something that I have a major distaste for). This made my shock all the greater when I discovered how tremendously wrong those assumptions were. The story, setting, and overall tone of the game are much darker than I expected. Nothing about the story feels “sappy” and the romance elements are given a bit of a backseat to a more complex, engaging storyline. The story begins in a remote, Victorian-era village plagued by perpetual snowfall. Local legend speaks of a malevolent witch who is the source of the town’s suffering and the never-ending snowfall. Because of this legend, the villagers are quick to turn violent around anyone deemed to be involved with “the witch”. To further complicate things, the town is comprised of two factions- the wolf clan and the hawk clan. These two groups are in a constant state of civil unrest. It’s in this town that our protagonist, Jed, was born and raised. Having been born with a red eye (the sign of the witch), Jed must disguise herself as a man and keep her true gender a secret from those around her. She also chooses to reside in a secluded tower in the woods outside of town. She shares this tower with a strange man named Ashen Hawk. 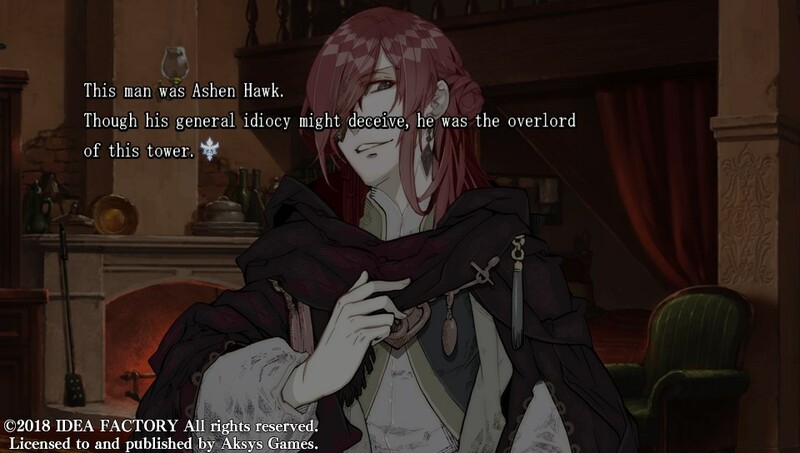 Ashen Hawk is a lazy amnesiac who allows Jed to stay with him in exchange for looking after the tower and taking care of him. The information that I’ve conveyed above is all laid out at the onset of the game. As the story progresses, romantic relationships are introduced, Jed sets out to locate a mysterious artifact, and we learn more about both Jed and Ashen Hawk’s pasts. There is also a sub-plot that revolves around a mysterious string of murders. The story overall is a nice mix of heartfelt moments and some downright brutal ones. These brutal scenes serve to darken what would initially seem to be a pretty light-hearted atmosphere. The game has 12 distinct endings, some spanning multiple flows of events. I enjoyed each and every one of these endings (even though some were much sadder than the others). 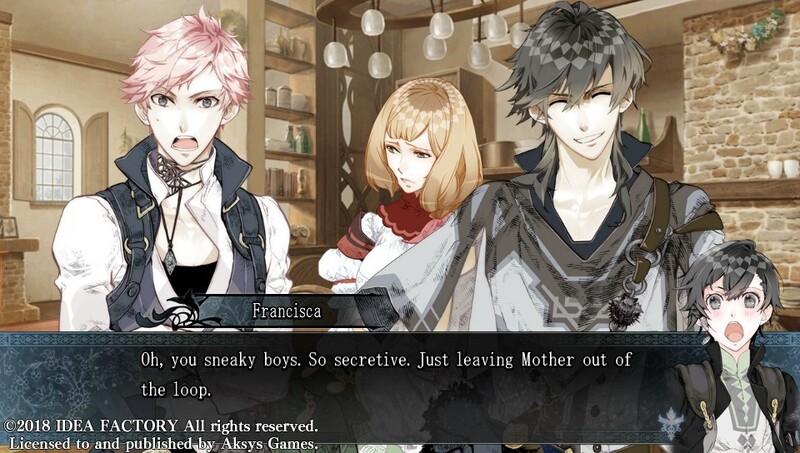 One of the things that I most appreciated from the story was the allusion to events and elements from the game Psychedelica of the Black Butterfly. 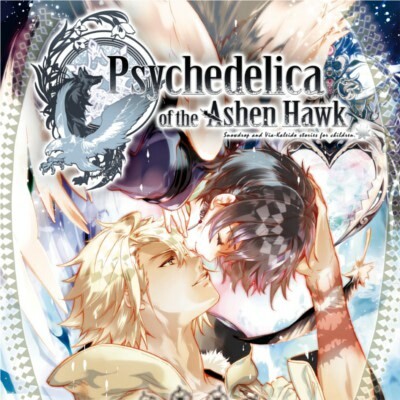 This is Psychedelica of the Ashen Hawk’s sister-game which released just a few months prior. I really enjoy seeing connected universes between different games and this is no exception. After finishing this game, I am equally excited about turning my attention towards the other one. In terms of how the story is presented, there are three types of events: main episodes, short episodes, and talk episodes. All three of these are available to initiate from map screens which change as the story progresses. The main story episodes directly advance the main story and must be completed to progress. Short episodes are more focused on character development and relationship building. Viewing these is often necessary for unlocking main story episodes. Lastly, talk episodes are essentially short, 10-second long snippets of information about the townspeople. Viewing these earns the player points which can be used to unlock additional content and short episodes. This is one of my main gripes about the game. Throughout my time playing, I found over 80% of these talk episodes to be pointless, adding little to the overall story. They consist of a quick question and answer and neither tended to be very interesting or have much of a point. This isn’t a huge complaint mind you, but the talk episodes just felt out of place among the rest of the story content. Other minor issues that I noticed include some very minor translation errors at points and some annoying save habits. There are autosaves in place for your progress and manual saves for your current “bookmarks”. Basically, the autosave keeps track of what you’ve seen while the manual save keeps track of where to return to when you resume the game. If you finish a series of main episodes and end up at a map screen, you are unable to save at this map screen. You need to instead choose one of the short episodes or main episodes on that screen and then save once you start viewing them. If you don’t do this, then regardless of any progress you make, you will be forced to view the episode associated with your last manual save. You won’t lose any completion progress, but you will be forced to watch or skip through some of the content again. This was a tad bit annoying until I realized what the issue was. When all was said and done, my total playtime came in at just over 15 hours. I thoroughly enjoyed all 15 of them. The artwork was excellent, the voice acting was stellar, and the music (while a bit generic at times) fit the atmosphere very well. Combining those elements with an interesting and engaging story, I feel that this visual novel is definitely worth playing (even if you’re like me and generally aren’t interested in playing visual novels). You can grab your own copy either physically or digitally on the PSN store for $39.99 USD. To give you an idea of how much I appreciated this game, I felt compelled after playing it to purchase a physical copy. I also went ahead and snagged a physical copy of Psychedelica of the Black Butterfly. For those who don’t own a PS Vita or a PS TV, there is a PC port of Black Butterfly releasing in November and I would not be surprised if Ashen Hawk saw a port shortly thereafter. I would highly suggest that you check this one out.